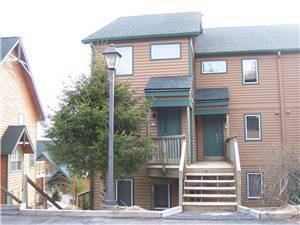 My spouse treats me to an expensive weekend stay at a condo on Snowshoe Mountain in West Virginia for my birthday. It is our first trip there, and I am eager. Snowfall for the season has already topped the all-time high for the Resort. And we are bringing our two naughty puppies to join us for the fun. Weather forecasts a week before our trip are disconcerting. While snow is forecast early in the week, a strong warm front is expected to arrive the day after our checking in on Friday. We experience a pleasant treat on our drive up the winding road leading to the resort. For the first time in my life, a relatively large red fox scampers across the road just in front of our car. So close that my spouse gasps for fear of my hitting the fox. Fortunately, I avoid him (or her). I make a hasty decision, given the warm front, that our best bet is to squeeze in as much outdoors as we can on Friday. So as soon as we throw our bags into the condo, we are strapping on our never-before-used snowshoes for a quick hike. Our puppies are more than happy with our decision. This will be one of their first-ever experiences frolicking in snow (one is a husky mix, so she is particularly thrilled). After our trek (where I learn that my snowshoes need some knife “surgery” to open up a larger hole for my shoes), I learn to my dismay that the resort no longer offers half-day lift tickets for skiing. I only have plans to ski a half-day this weekend, so I balk at paying $70 for a few hours on the slopes. In no time, I find myself on the Silver Creek slopes, and am surprised by the modest lift lines. And the excellent condition of the powder on the slopes – despite the lateness in the day. For my first run, I blindly choose a run called “Spur.” My heart starts racing nervously, though, as I get my first glimpse down the slope. To my mild horror, the run is a “terrain park” that seems to consist of huge ski jumps and nothing more. And I am already committed to the run, since alternative runs are a very inconvenient uphill slog. I toss caution to the wind and start hurtling down, not knowing whether I have anywhere near the skills to survive what lies ahead. Fortunately, there are tiny twists and turns around each of the intimidatingly high jumps, and I happily and surprisingly skillfully zip around each one. Spur becomes my favorite run of the night. I’m rapidly going up and down the runs and lifts. 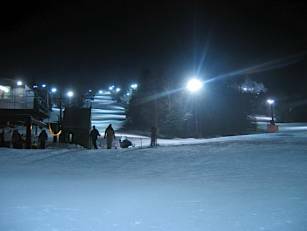 I’m having a ball on nearby Cascade and Fox Chase runs, as well as Spur, as darkness falls and the stadium lights illuminate the slopes. My skiing on this night ends sooner than I have planned. The nighttime air is rather bitterly cold. And I am anxious to get to the condo to join my non-skiing spouse to help her cook a delicious, romantic meal that we will eat in front of a warm fireplace. 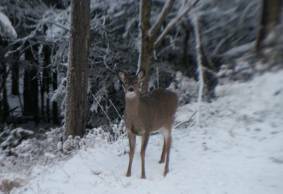 That night, we begin to notice the “wildlife.” While Snowshoe Resort uses a bunny rabbit as its symbol on flags and signs, we quickly and repeatedly learn that the mountain is seemingly covered with deer. Every time we turn around -- in our condo, on the road or on trails -- we see a crowd of them near us (and our excited puppies, who love chasing them!). I’m no zoologist, but it appears that Snowshoe has a deer over-population problem. On Saturday morning, we are greeted by a sunny, warmer day. Clearly, if we are to hike, we need to start first thing in the morning to avoid, as much as possible, the near certainty of slush later in the day. We choose to sample the Cheat Mountain Ridge Trail, which skirts the eastern side of Snowshoe Mountain. Our early start means we see almost no one in our 8-mile roundtrip hike. We pass by the Sunrise Cabin, aptly named as its long eastern face and wood porch basks in a glorious morning sun. We vow to one day reserve this very secluded, romantic lodge in the future. Our puppies try to follow each of us to the top, but we turn them back due to the danger to them. We soon find, however, that it is also a scary ascent for humans on this day. High winds give me the creeps as I climb each flight of metal stairs. 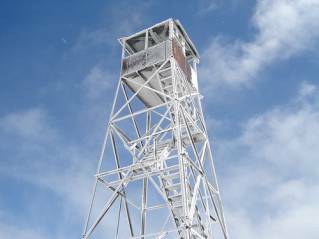 “Will these strong winds knock down the tower?” Nervously, I hold on to the railing the entire time I climb to the top, feeling like a scaredy cat. But the climb is worth it. In the look-out cabin at the top, the view is panoramic and grand. We get a magnificent view of the entire region. Wow. By the time we return to the condo, we are tuckered out by the wet snow hiking in snowshoes. After enjoying the some of the Ceurvo Winter Games (mostly homemade cardboard “race” toboggans), we head for the expansive heated resort pools and spas for 45 minutes of soothing soaking. We return to the condo for our second night of a cooked spaghetti and putenesca sauce dinner, and a delicious Italian Calabrian red wine (which, as a Calabrian, I am particularly proud to enjoy). With 60 trails, a summit elevation of 4,850 feet, a 1500-foot vertical drop, and three high-speed lifts, Snowshoe is known for being one of the top ski mountains in the eastern US. We intend to return. And my spouse has promised to take up downhill skiing again so she can join me on the frolicking slopes. On Sunday morning, our plans for one last short hike are quickly abandoned. We awake to what appears to be the mountain enveloped by a cold, very windy rain cloud lashing sheets of icy rain at us. But all in all, our weekend was a delight. And we look forward to coming back.